We’re all podcasting, apparently, so why not merge all of your hobbies with one device? We cast RØDE’s latest far and wide to see if it fits the bill. We’ll get one thing straight from the off, mind: this unit is designed more from the podcasting side of things than the audio side. However, the simple design, aimed at less technical podcasters rather than more technical producers, might well tick a lot of boxes, and the spec seems pretty decent for both podding and producing. 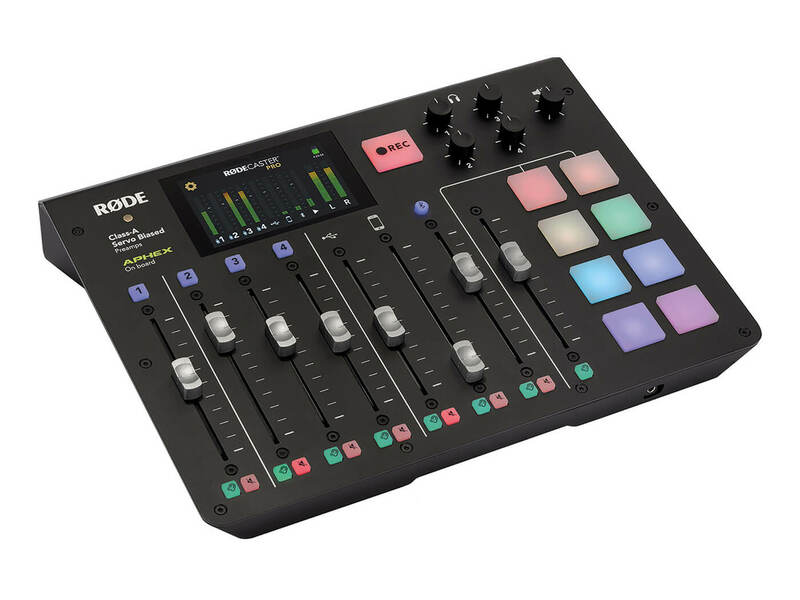 RØDECaster Pro can act as a USB interface and mixer, the thinking being that you can send your cast straight out via your computer or into your DAW to edit it before you broadcast it. You get four Class A preamps, which RØDE claims are the same ‘as found in broadcast consoles that cost hundreds of thousands of dollars’. You can connect up both dynamic and condenser mics, and there are also a load of effects to choose from including Aphex’s Aural Exciter and Big Bottom, not to mention compression, limiting, de-essing and noise gating. That’s pretty decent so far, and specs not completely out of sync with those found on a regular fully fledged audio interface, but RØDECaster Pro has some other neat features up its sleeve, all dedicated to the ‘cast. First there are the eight trigger pads which can be programmed with different sound effects and jingles – it’s basically a pad sampler under another name, but a very neat addition. You can drag and drop audio files onto these using the supplied software or record direct into them via the mic ins. You can also use the unit standalone and record the results to a micro SD card or stream it live. At the time of writing, this is just to a stereo file although new v1.1 software is imminent, and that allows you to record to separate multi-tracks, which is great for when one of your famous guests messes up so you can correct them later. Finally, for podcasting, you can connect your phone to the unit and it automatically provides ‘mix minus’ audio to prevent echo being heard by the caller, so you can easily draft in guests remotely by phone. That all sounds pretty good so far, so how does the unit square up in practice? 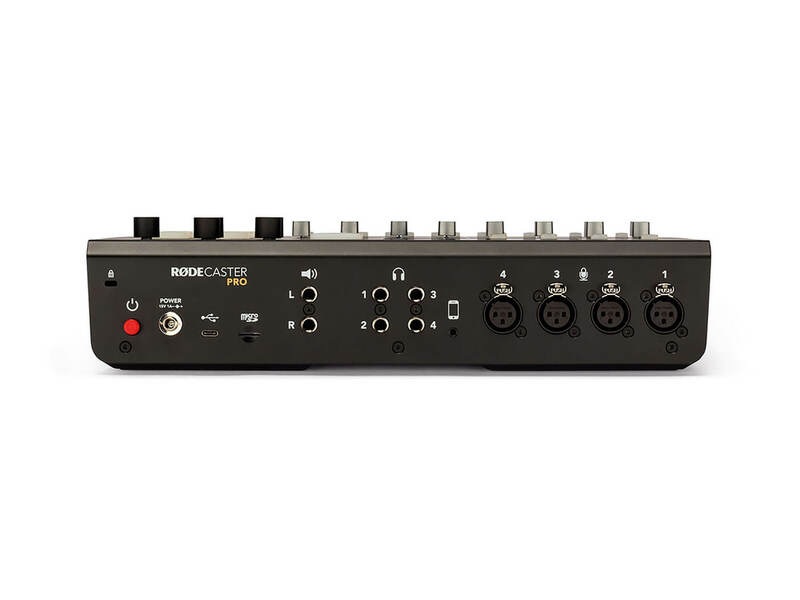 RØDECaster Pro has clearly been designed with ease of use in mind. It’s colourful, clear and obvious. 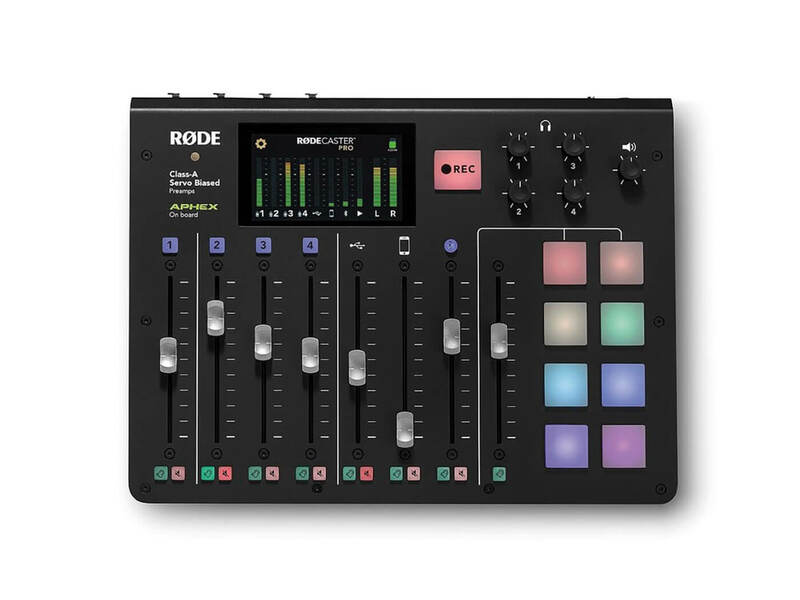 There’s a lovely touchscreen, eight reasonably solid faders (four for mic, one each for phone, USB and Bluetooth sources, plus a master), the sampling pads (all multicoloured), plus headphone and output-level controls. Around the back you get four mic ins, one phone in, four useful headphone outs (so each user can monitor their feed and adjust via a front-panel rotary), plus main outputs. USB, power and Micro SD slots complete the back panel and, all in all, you wonder why all interfaces couldn’t be laid out this simply. Everything is there that you need, it’s obvious what does what and you’re up and running in no time. There are no instructions as such, probably because operation is so simple. Instead, you get several large cards that show typical uses and connectivity. Other than that, it really is a case of connecting up your sources, adjusting levels and casting off! There’s a blindingly obvious Record button that will feed everything you put into RØDECaster Pro through to the SD Card or computer and, really, operation couldn’t be any simpler. Testing with a microphone as a source and it is clean and bright, easy to monitor and great quality, probably as you’d expect given the RØDE name and the Class A mic pre claims. I tried a couple of mics, including RØDE’s own PodMic (sold separately for £99) which is a chunky and very solid dynamic mic. 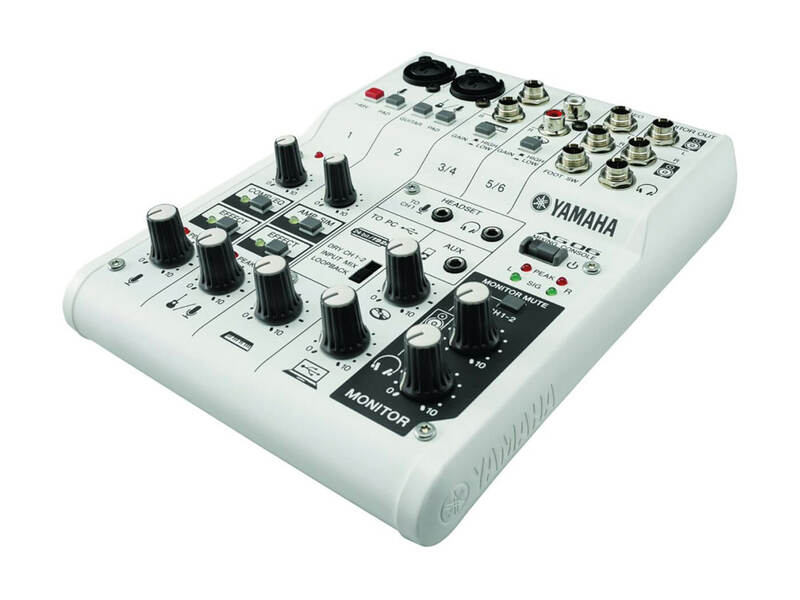 It is, apparently, designed to partner with RØDECaster Pro and the two do make a nice couple. The sound is clear and crisp, as you’d want from a podcast – all very Radio 4. Connecting a phone is just as easy. The only problem I ran into was USB connectivity which was a bit hit and miss at first. However, this was solved with another cable and another USB port, so I suspect it wasn’t a fault of the unit itself and I soon had Logic set up with the RØDECaster Pro as an interface. Okay, this isn’t specifically designed as an audio interface, but one of the points of this test is to see if it can handle both audio and podcast duties. The playback is very good indeed, with both monitor and headphone response being smooth across the frequency range and accurate, which again, given the specs, shouldn’t be too surprising. It might not deliver the full response of a high-end interface, but it performs well vocal wise. You are limited to mic inputs, of course, although you could make use of the phone connector as a line, of sorts – not ideal, but possible. The point is, that if you are doing both singing and podcasting you could get away with just this box, so in that sense, it succeeds where others don’t. Finally, there is a software app to download and partner with the RØDECaster Pro. 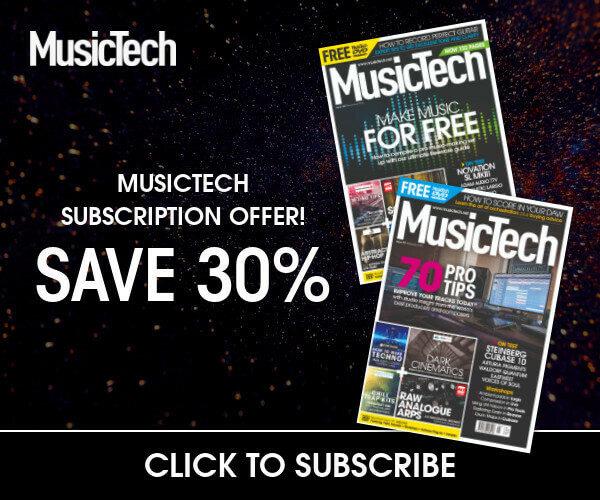 There’s not much to it – you can use it to drag and drop audio files onto the various pads and change their colour – but it’s a useful tool to make quick changes. I suspect this will be updated in the future to offer a bit more in terms of routing and monitoring flexibility. Yes, RØDECaster Pro is more podcast than studio tool, but there is plenty to get excited about to cover both bases. Four mic ins will give you a lot of audio flexibility and they are certainly good enough quality as a front end for your DAW. The effects are great, too, offering loads of control and editability over your input signals. For podcasting and audio, this is a good crossover product, but the emphasis is most definitely towards podcasting. Where it doesn’t score is to be used just as an audio recording tool. You’d be wasting the extra features and the price is pretty steep if all you want to do is record stuff into your computer – you’d be wasting all of the fun extra stuff that is thrown in for podcasting. Treated just as a podcasting tool, you might still consider the price steep, especially as you can get a fully featured, good quality interface with all the connections for less than half the price. But throw in the sampling pads, the touchscreen and workflow and it definitely makes a good case. Monetise your podcast – or get David Tennant in – and you’ll make the cash back in no time. This isn’t perhaps a standard piece of MusicTech tech, as it is aimed at a specific type of broadcast. But the intriguing thing is that you can carry out basic production tasks with it, too. Need to get audio in and out of your computer fast and interested in podcasting? Well, this could do it all for you. If you are already podcasting via your current audio gear then it is not a must have, but if you are starting out in both podcasts and music, it could be a one-stop buy. This series is aimed at pretty much anyone with small mixing ambitions, including podcasting, and the 06 has decent input numbers but no recording, nor the other podcast features on the RØDECaster. It is very cheap, though. 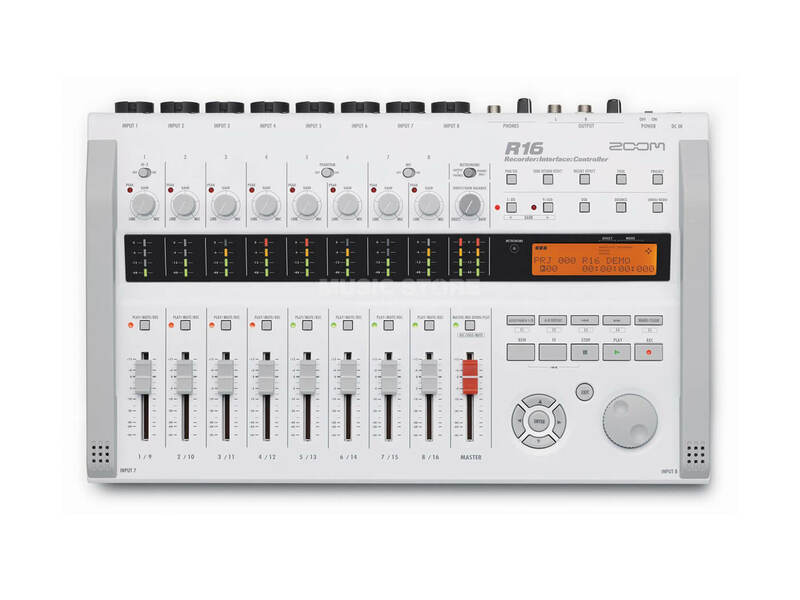 Sadly, we’ve not looked at this Zoom yet, but its spec puts it right up there as a recording interface and mixer. You can record eight tracks simultaneously, mix, and even use it as a DAW controller. Once again, no jingles but, once again, pretty cheap. Great for podcasting and a good audio crossover tool to boot.